The Only Reversible Commercial Gym Tile with a Bevel on Either Side. The team at Versafit have worked tirelessly to develop and design a safe, durable and practical commercial reversible gym tile with a bevel on either side. This is the only rubber tile on the market, which can be flipped to extend the lifetime of the flooring for any facility. Designed for busy commercial fitness facilities with heavy foot traffic, the Reversible Rubber Gym Tile can be flipped to last up to 2x the general life expectancy of your average recycled rubber gym tile. 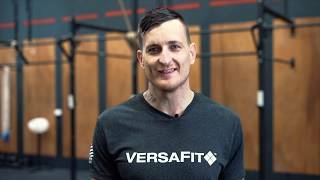 VersaFit is made to last in the busiest of gyms, cross-training boxes, clubs and workout areas without cracking or breaking. VersaFit can be installed in areas with heavy foot traffic (free-weight areas, strength training areas and group class areas, etc.) and will last the test of time through daily use. Safety is the number one concern for commercial gym applications. VersaFit has been designed for excellent performance across slip resistance, fire and smoke emissive conditions to ensure safety in the workplace and gymnasium whilst exceeding all compliant requirements. All VersaFloor products are made with raw materials that are known to not pose any hazard to the environment and to the people during manufacturing and handling process; free of asbestos, free of halogens and free of PVC. VersaFit Gym Floor Tiles use direction free rubber chips, in a variety of colours which allow for a wide variety of patterns to give you the flexibility to suite your space. Suitable for indoors and outdoors*. Simply sweep the surface of your flooring with a soft-bristled broom or use a vacuum to clean. VersaFit contains a microbial treatment which ensures freshness at all times and reduces the risk of mould build up. VersaFit contains a high percentage of recycled rubber and contains no substances that cause harm to the environment. It is halogen free, formaldehyde free and PVC free. VersaFit itself can be fully recycled and does not generate toxic substances at the end of its life. VersaFit uses highly flexible compounds providing a high level of noise abatement. *Please note that tiles ordered separately may vary in thickness +/- 2mm due to batch variations. VersaFit Gym Tiles have been tested for Formaldehyde content, Phthalates, Lead and VOC, which are commonplace among other rubber flooring tiles on the market. VersaFit PASSES all respective tests making VersaFit Gym Tiles some of the safest on the market to use. Produced by ISO 9001:2008 registered manufacturer of high-quality resilient rubber flooring products, VersaFit is committed to environmental protection and stewardship. VersaFit’s goal is to mitigate impacts on the environment by working with all stakeholders to promote and implement responsible environmental practices, products and continuous improvement. VersaFit 15 mm x 1m x 1m gym safety surface tiles are moulded under pressure and heat. Designed to provide a resilient, durable, slip-resistant surface with excellent impact attenuating properties. To tell the difference between cheap look-a-likes and VersaFit Rubber Gym Tiles just look at the bottom of the tile for the VersaFit logo moulded into the tile and the signature laying instructions. Buy VersaFit Gym Tiles and you will be guaranteed a safe and quality product for years to come!